Shock findings reveal that the Thames has the highest concentration of wet wipes ever recorded in Britain – with 277 found in just one square metre. Over 4,500 wet wipes were found on one 154m sq patch of foreshore at our latest Thames River Watch citizen science event, the biannual Big Count: the highest number ever found in one place. It’s likely that these figures are just the tip of the iceberg as the densities of wet wipes increased with distance from the shore. Unlike bottles which float, wet wipes are heavy, so they tend to sink to the bottom of rivers. For this reason they have been described as a ‘hidden plastic menace’. 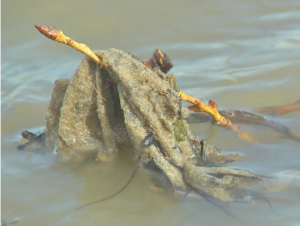 Wet wipes are changing the shape of the Thames river bed, binding with mud and twigs to form mounds on the inside of bends where the water moves more slowly. The Big Count event was the first attempt to quantify the impact of wet wipes on the capital’s river, and was filmed by Sky News as part of its Ocean Rescue campaign. Many people across the country, including London, flush thousands daily down the toilet, because they’re marketed as ‘flushable’ when this is not the case. Many wet wipes contain plastic, and are not biodegradable. In London, our Victorian sewerage system overflows on average once a week and when this happens huge numbers of wet wipes are dumped straight into the capital’s river. The Thames is in a worse position than coastal areas because the sewage outflows are discharging into an enclosed space and the movement of the tides keep wipes in the river for longer. As the wet wipes break into smaller pieces, they contribute to the global microplastics problem, breaking down into tiny particles which enter the food chain and endanger marine life. A recent study found more than seven in 10 Thames flounder had plastics in their stomachs. Thames21’s Thames River Watch programme is the only one monitoring plastic in the Thames as well as its water quality. It’s also the only programme empowering ordinary citizens to connect with and protect the Thames through citizen science. The figures were produced by the third annual open survey conducted by Thames River Watch called The Big Count, in which ordinary Londoners monitored a patch of foreshore south of Hammersmith Bridge to record what they found. A previous survey found 150 wet wipes in a single square metre of Thames foreshore. That is far higher than the 50 found per kilometre of coastline in a study by the Marine Conservation Society, which has raised the alarm over a four-fold increase in wet wipes around our coastline. It is likely that the Thames’ wet wipe problem is affecting other rivers around the country. There are between 25,000 and 31,000 combined sewer overflows around the UK coast that discharge raw, untreated or lightly treated human sewage, particularly after periods of heavy rain or during breakdowns in the sewerage system. Wet wipes have increased by 700 per cent over the past decade. Thames River Watch organises two public Big Count citizen science events a year where anyone can join. Those wanting to get more involved can join Thames21’s citizen scientist training – no prior knowledge is required and they only need to spare 2 hours a month.